Midwest River Towns Ready Themselves For Cresting Floodwaters : The Two-Way Towns in Missouri, central Illinois and at least four other Midwestern states are under a flood warning, as heavy spring rains swell the Mississippi and other rivers to dangerously high crests. In Clarksville, Mo., Bob Bailey adjusts a pump as he tries to keep floodwater from the Mississippi River out of a rental property Sunday. The small community has worked for days to build a makeshift sandbag levee. 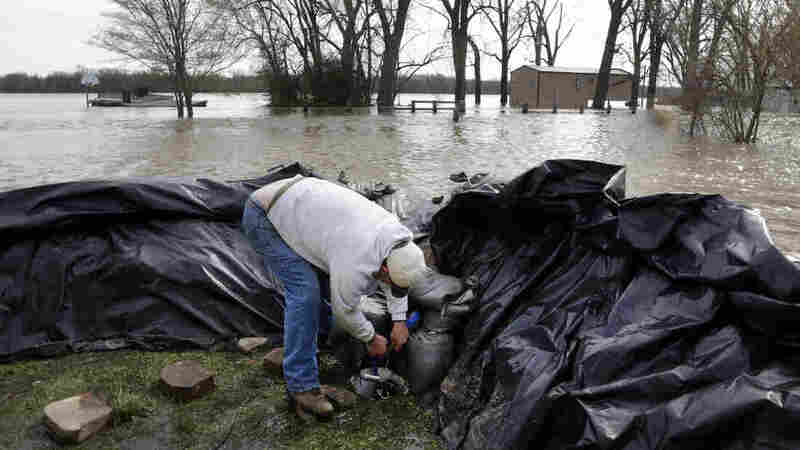 Towns in Missouri, central Illinois and at least four other Midwestern states are under a flood warning, as heavy spring rains swell the Mississippi and other rivers to dangerously high crests. In some areas, rivers have already hit record flood levels. In places where residents have been forced to evacuate their homes, the American Red Cross has set up shelters at schools and other facilities. From St. Louis, KMOV TV reports that several bridges over the Mississippi River were closed Sunday after more than 100 barges broke loose south of the city the night before. Missouri Department of Transportation officials told KMOV their main concern was that the barges might severely damage the bridges. That danger seems to have passed, however, and most of the barges have been secured. The Coast Guard has closed some 15 miles of the river to traffic. The areas in most immediate danger include the Quad Cities, just north of St. Louis, though areas farther south may soon be vulnerable. Rivers in at least six states are swollen after torrential rains drenched the region over the past few days. North of St. Louis, the Quad City Times reported that both the Mississippi and Rock rivers were expected to crest in the area along the Illinois-Iowa border Sunday. And National Weather Service meteorologist Andy Ervin was telling people to expect the water to stick around. "The Mississippi River is going to stay above major flood stage, 18 feet, through Thursday," he said. "The Rock at Moline [Illinois] will stay above 14 feet through Thursday afternoon." In a flood warning issued Sunday, the National Weather Service said additional rain is likely late Monday and Tuesday, which will slow the water's descent. On its website, the service has posted a U.S. map with real-time data from sensors in rivers and streams.